Try not to react immediately to someone’s problem, because, sometimes, it may be dangerous. First of all, in this situation, you have to understand the problem, he/she is having. To do so, you have to think through his/her point of view. “Thinking through one’s point of view” means that you have to imagine what should you have done if you would have gone through the same situation, and whether it would have been right or wrong. 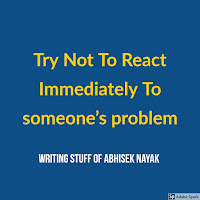 After doing so, you can give the right reaction or advice to the person.